The has V60 plug-in diesel hybrid has a range of up to 1,200 km (745.6 miles) when combining the range of both the motor and engine. Volvo says it will begin sales of its V60 plug-in hybrid diesel next year, after unveiling the car earlier this year at the Geneva auto show. The plug-in hybrid is the result of an industrial partnership launched in 2007 between Volvo and Swedish energy supplier Vattenfall and the automaker says it is the market's first diesel plug-in hybrid. The car has a range of up to 50 km (31 miles) when driven purely by the electric motor, which jumps to 1,200 km (745.6 miles) when combined with the engine's range, Volvo said in a statement. The car's front wheels are driven by a five-cylinder 2.4-liter turbodiesel engine producing 215 hp, while the rear axle has a 70 hp electric motor, which receives power from a lithium-ion battery pack. Volvo says the resulting vehicle provides drivers with the best properties of both an electric car and a diesel-powered vehicle, with low fuel consumption of around 1.9 liters per 100 km (148.7 UK mpg or 123.8 U.S. mpg) and CO2 emissions of just 49 grams per kilometer. "One important aspect of the project was to retain the Volvo V60's excellent driving pleasure, high safety standard and luxurious comfort. At the same time, average CO2 emissions and fuel consumption will be halved compared with what is available on the market today," Stefan Jacoby, CEO of Volvo, said in a statement. Volvo hasn't revealed pricing for the V60 plug-in hybrid when it launches next year, but due to the cost of the hybrid's battery pack, the vehicle will be more expensive than the conventional combustion engine-driven V60, which starts at 29,650 euros for the entry diesel model in Germany. 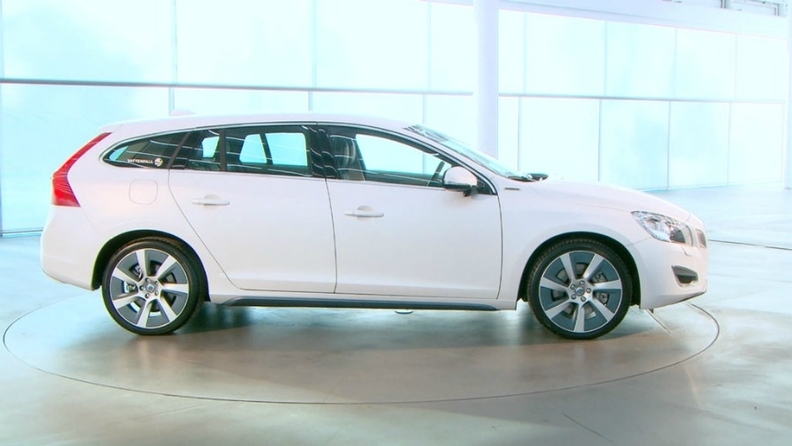 However, the company calculates that fuel costs will be one-third compared with the combustion engine V60. The vehicle will take around five hours to charge from a standard domestic electricity outlet, Volvo says.